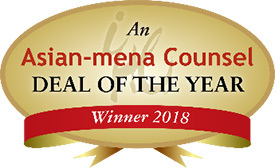 Nishimura & Asahi has received two “Deal of the Year 2018” awards from Asian-mena Counsel magazine. Asian-mena Counsel’s editorial team annually determines the most stand-out transactions from the Asia-Pacific region that closed during the year across various practice areas based on their sophistication, innovation and complexity. Asian-mena Counsel is published by Pacific Business Press, Hong Kong.